Tuesday I didn't trade due to technical difficulties and yesterday I fought the tape all morning and ended up -.2RR. This morning, I could not build a case for longs and in hindsight, I'm still having trouble figuring out how I could have built the case in the hour or so before the open. 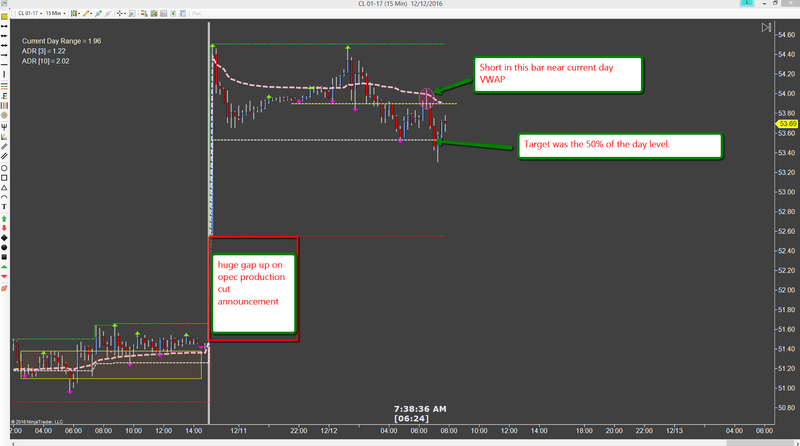 My lower time frame charts were all long just before the open but that didn't fit with the short premise I had built. 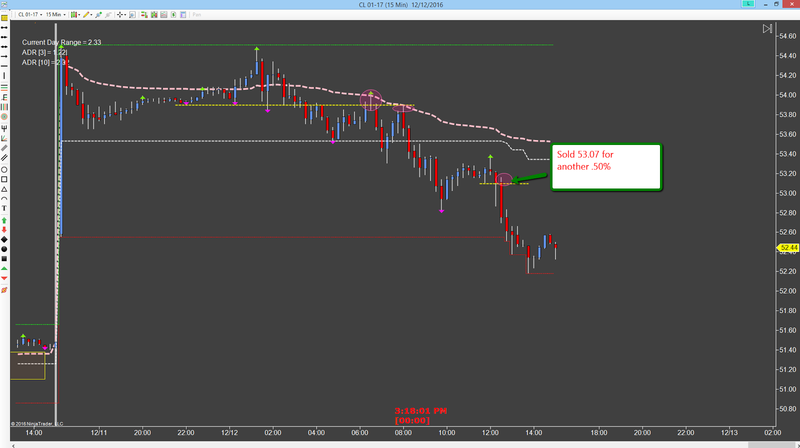 First two trades were stop outs for -.125% each. 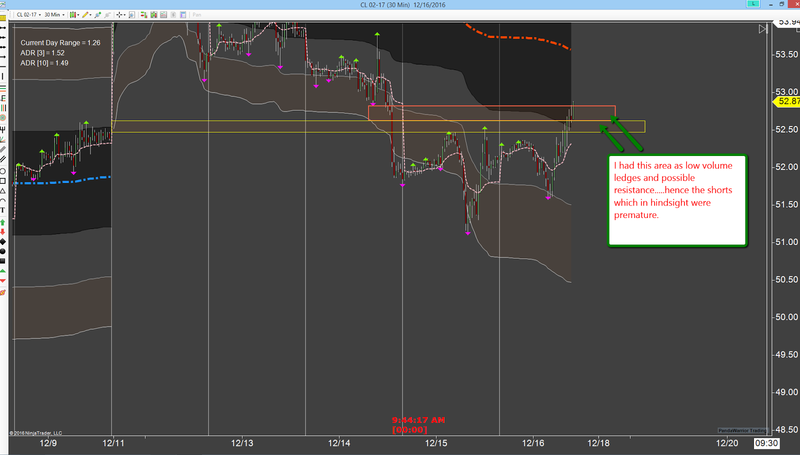 I reversed my last short into a long just after the open and held for enough to recoupe the losses plus a bit. Finally price reached the weekly VWAP which happened to be yesterday's VWAP as well as the 50% pull back on yesterday's candle. Price stalled there and I got in very near the top. No heat, and produced a net of 3RR for today. After the initial long which I didn't believe in, I figured it might reach the area where I eventually shorted, but there didn't seem to be any real reason for it and I could really figure out a way to get in without something like a 1% risk position and since I'm not doing that at the moment, I sat idly by as price ground up and eventually reached the level where I guessed it might go....but by then, I'd built a new short premise off that level which worked. I'm about .25% away from being break even on the year. I'm not happy about that for sure, break even is better than losing but I'm also not really happy about not being up 50-100%. Going into next year, my goals are to just grind it out like I have been the last couple of weeks. However, I do plan to begin scaling into trades a bit more and let at least some of that position run on days where it looks like I might be able to get a runner. I want to see if I can get a 5-10RR day once in a while to help make up for the losing days that are sure to come. The pic tells the story....but essentially I wanted to try to end the year on at least a break even note. Almost there...might trade tomorrow as well. I'm about 2RR away from it at this point.....I'm not going to push it though, I've seen what happens when I and others push to make a certain goal by a certain deadline. That usually ends in draw down. So more caution is in order....nothing fancy, just wait for the right areas and only trade if the conditions warrant it. I finished my mortgage license continuing education yesterday, took the test and passed with flying colors. Now its time to renew the license. Will do that sometime this week once the CE company notifies the state of AZ. Now I have one last class to finish for my degree but it doesn't start until Jan 17th so I have nearly a month off from the books. Doctors appointment in an hour and I need some food. Looks like price is still trying to close the huge gap from Sunday night. 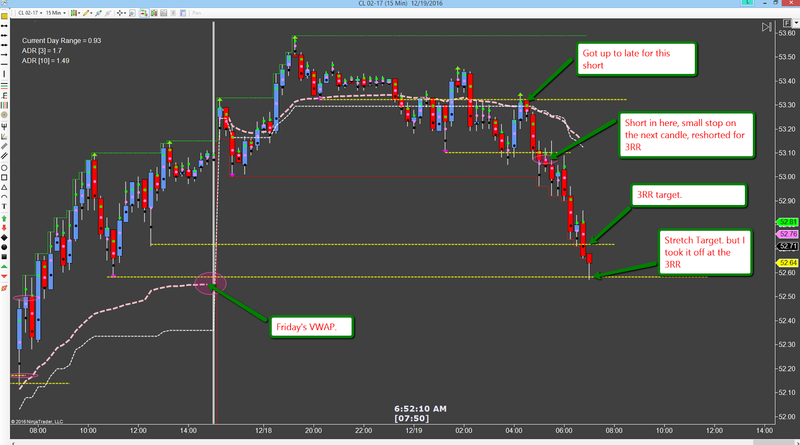 I woke up an hour early for some reason today, and was able to find a pull back short to the 50% level + VWAP. Didn't get filled at that exact level but pretty close. 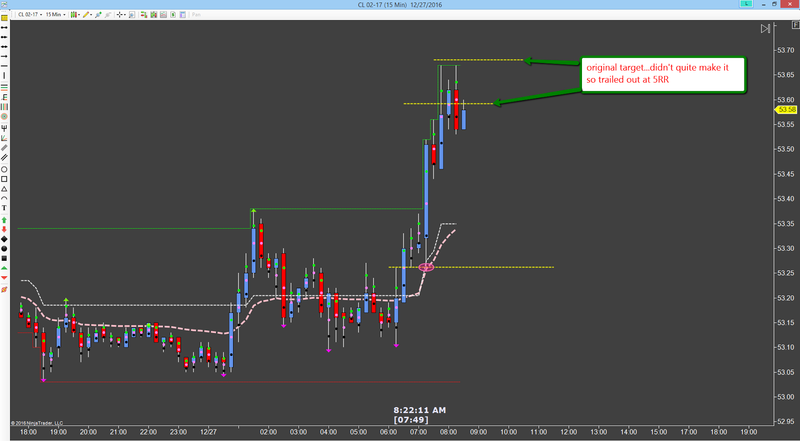 Trade 1: Price went my way about 10-11 ticks and I added another lot to the trade and moved the stop to match the original risk. 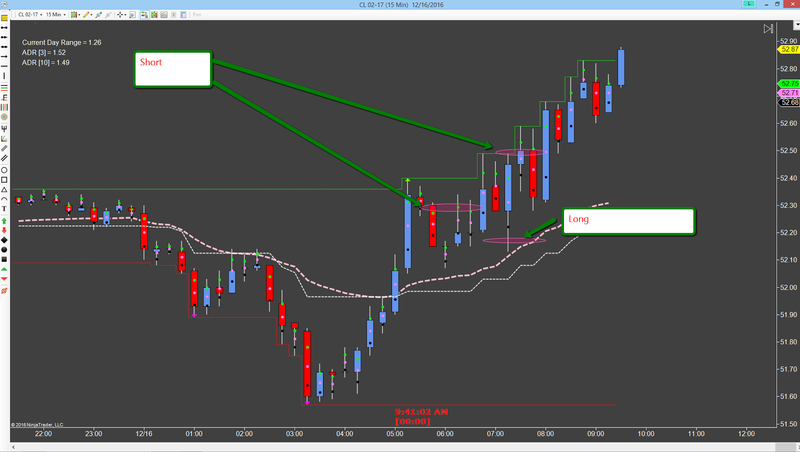 This stopped out after going about 5 ticks my direction and after I moved the stop to within a couple of tick of the blended entry. Price was stalling near the lows and I figured it was over so no sense in risking the entire thing. -.08% loss. However, I should have left the stops alone, after taking my stop, price moved up a few more ticks and then reversed back down for at least enough to have gotten out BE. Which is producing the temptation to chase it. I'm going to resist the chasing temptation if it kills me. Trade 2: Got another chance at the same price as the original trade. Took it with the same original risk. It basically tested what look like a double top. At least for now it is. Wait and see. Added to the trade once it got going. Potential 4RR trade if it goes to the 100% extension. 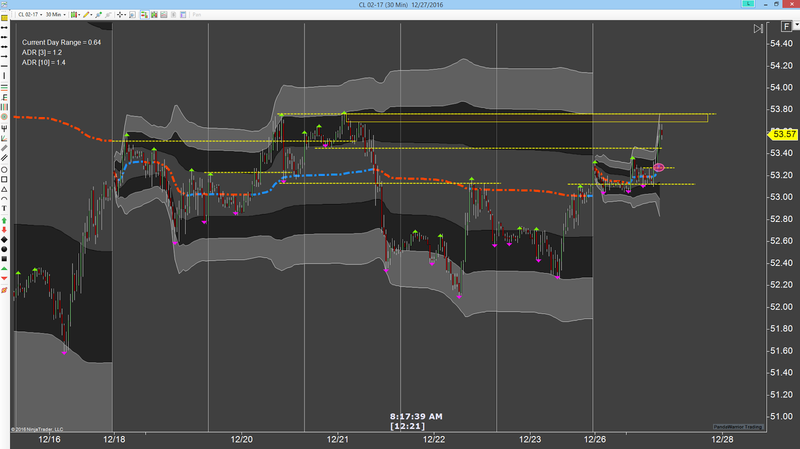 Closed it out as it started stalling around the 52.00-51.95 area. 3RR. It hasn't made it to the 100% extension yet and it might not. Regardless, its going to do it without me. Ok, not the best execution today but good enough to make .55%. I'm happy with that. Time to hit the books. Its only 6:20AM AZ time. Cash market isn't even open yet and the daily range is only 62 ticks. 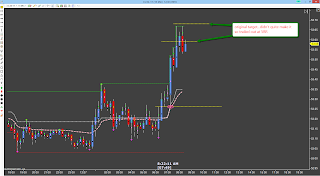 Making money in a narrow range. I like that even better. Here is the 15M chart with my entry area highlighted in the pink circle. Two entries in there. By the way, if you want to hear great trading stories and advice, go check out Trader Dante on you tube. Freaking funny and smart. Missed the obvious trade at the top. The double top, yesterday's VWAP.....sheesh. It was a "money in the corner" trade. Got there just a bit to late. Tried to fill one but it just wouldn't go back there...almost but not quite. Watched a 4X trade happen without me. 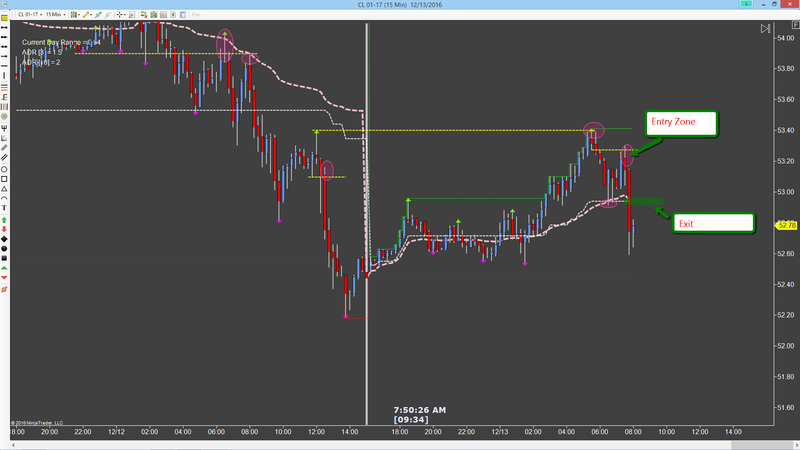 Trade 1: 1.5RR Got long at the 50% pull back + VWAP. Exited as it begin to stall. Missed a 3RR trade off the VWAP as it tested it for the second time but I was less sure this time around and slowly shifting my bias short. As price tested the break down area near the high, I shifted completely to short. 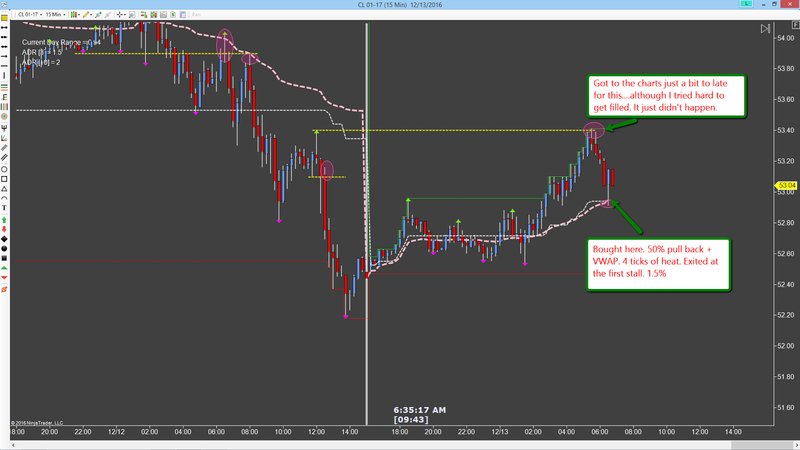 Trade 2: Entered short and was rewarded with an exit back at VWAP for 3RR. 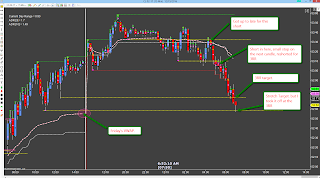 It's still going as I write this but the VWAP exit was the planned exit as I was sure it would make it there but past that, I didn't really have a good plan for anything more and I'm pleased with the trade planning and execution overall so good day today. Just a side note. I'm watching this 15M chart but using a much smaller time frame for entries to help keep the risk small. That one is pretty messy so I'm only posting these 15M charts so show th elevels and my thinking. Done for the day. Time to hit the books. Lets think about this for a minute. I'm down around 5% over the last month. That's more than I want to see gone in a single month. 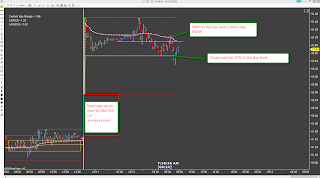 But the truth is, its worse than it should have been had I reduced size quicker and better than what it probably would have been had I not simply stopped trading when I reached -1.0% for the day. I've reduced size to a single lot going forward with a max risk per trade of .25%. However, today's actual risk was .125%. I held for 3X on this and ended the day with .50% return on capital. There was a few more ticks to be had on that trade but the planned exit worked well for me. Honestly, the reduced size and the tiny risk made holding the trade much easier. Granted it wasn't a 100 tick win but I don't care. If I replicate this day over and over again, soon I will have regained all of the draw down and back toward building the account. That's all I care about at this point. Just slow steady returns over time and increase size when I'm comfortable with the increased risk. A half percent per day is 10% per month. Assuming only ten months of the year traded that is 100% return over the year. Not bad for barely risking anything. I need to keep this in mind every day. Tiny risk, hold for at least a 3X multiple of risk and be satisfied with the baby steps. Occasionally conditions will present themselves where a 100 tick win is probable. I'll try to take those but honestly, I'll probably miss those. I'm not geared to look for those very often. They happen every week but my brain isn't wired like that for now. I think I'm just going to be happy banging out .5 and 1.0% days for a while. EDIT: 12:00 NOON. AZ TIME. There was a 100 tick move that began around 8AM my time. I'd left the office by then. Had I been here, I doubt I would have seen this developing and even if I had, I'm not sure I would have or could have taken it due to risk....might have had to look at a very small time frame to make this happen. Any way, here it is. 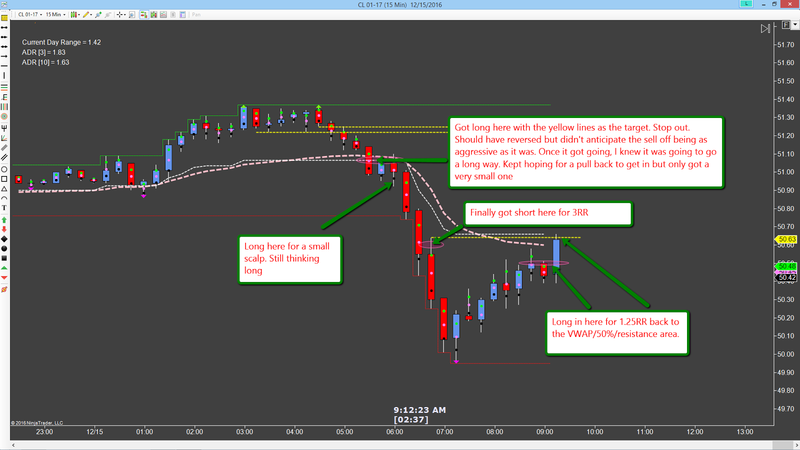 Yesterday, I was short early on a breakout pull back that stopped out immediately. Then long after a pull back. 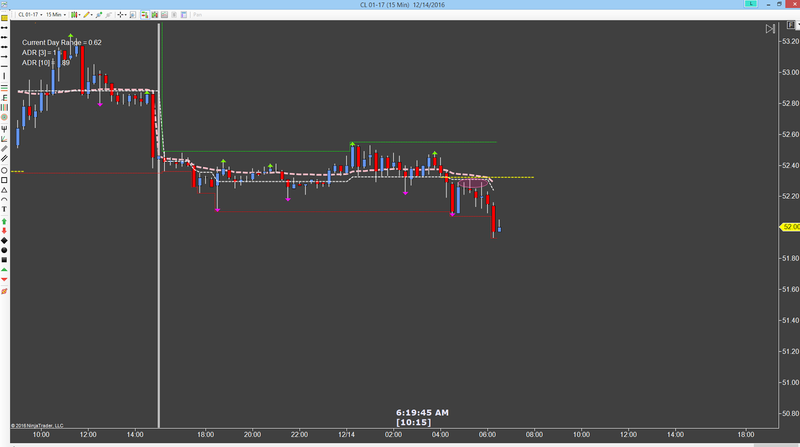 Actually bought the low tick of the pull back which was nice....but it stopped at BE after a long hold. 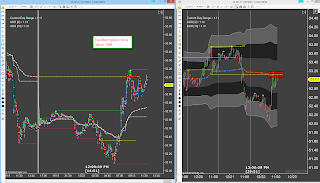 Then got long again with another BE.....and finally a long with a small stop out.....First trade was full size, remainder were one lot trades. Next week is my last trading week of the year. I plan to reduce size to a single lot on all trades. This will result in about a .25% risk per trade. I'll only risk .5% per day so essentially one or two trades a day. I have finals next week and I have to renew my mortgage license before the 19th which is about 8 hours of continuing ed before I can renew. Once next week is over, I'll be off for the remainder of the year. January 1st I start studying for the CLEP test I need to finish my degree. One last thing and something I've chased for 30 years will finally be done. I'm not sure what I'm going to do with it but I'll have the piece of paper I've wished I had all these years. Going into January, I'll be staying with the .25% risk per trade and I'll leave it at that until I am winning again. Further, I will only be trading from 6AM to about 7:30AM....this is basically to begin ramping up for what my schedule will be when I start work at the bank in a couple of months. When I get to that point, I want to be dialed into the new routine. So this means whatever I get in that period of time is what I get for the day. From this point forward, my trading will be about building the account vs earning a living from it. Earning a living from trading has been almost impossible. Stability is more important. If the account gets large enough so that I can make monthly or annual withdrawals without endangering my ability to trade large enough size to cover the monthly nut, then I will consider quitting the day job. And so a new season begins. So today was a fail in the sense that I made the same mistake twice. 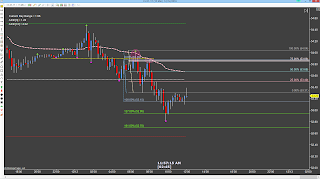 I was long with a ten tick stop but needed 11-12 ticks. I thought I had moved it the needed couple of ticks but when I turned loose of the mouse, I guess I moved my hand or something. Anyway, I had a ten tick stop, which got hit almost immediately. Thing was though, it was to the very tick. Exactly ten ticks. The premise of the trade was still valid so I took it again. With the same ten tick stop thinking now way it revisits that level again.....sure enough, another exactly ten tick stop out....on the very next bar. First trade was with full size resulting in a .50% loss, second time was with a single lot bringing me to about .70% loss. After a bit, a double top formed and I got short after it stalled and that did a one tick wonder and reversed for another quick hit. Total now is about -.85% plus commissions and I'm getting close to -1.0%. Finally decided it would go back to the weekly VWAP at 50.89 and got long on the break of the double top but that is not in my trade plan and the risk was very high in terms of ticks so I just closed it out at +1 or 2 ticks. Net after commissions was about -.95% so I've rounded to -1.0% to keep it even. Pass or fail. Direction, pass. Entry locations, pass. Planned exit locations, Still unknown but I think a pass. Stop Execution, FAIL. I've made some charting changes after watching the last few days. I've reduced my input to three charts. 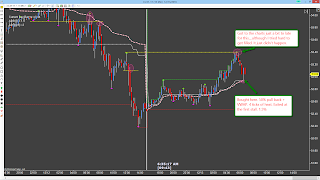 A daily with trend indicator, a 30 minute with the same trend indicator plus weekly VWAP denoting value areas and a 5 minute with the same trend indicator. The idea is to simply trade in the higher time frame trend direction. Today the 30 minute chart was in potential reversal mode while the 5 minute chart was in full long mode. 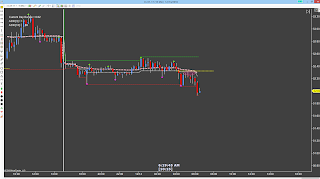 My first trade was a short that went around 10 ticks or so but because the 30M was in transition, I elected to move to BE and let it play out. I had a feeling the buying I saw come in was real and would drive price up beyond the 5M break down zone and it did. After that, longs only until it started looking weak again. This idea was wrong and had I not been stupid with the stop placements earlier, I would have still been in the longs and let the short idea pass me by. I think so anyway. Regardless, I feel better about the WAY I lost today than I have in the past. Two reasons, I was reading the market much better where last week and the few weeks prior, I've felt sort of blind to what the market wanted to do and secondly, the losses were execution errors and not analysis errors. Both of these are encouraging to me as I've been loosing due to analysis errors a lot lately which has certainly affected my ability to hold a trade long enough to have it play out. As I'm writing this, the longs seem to be working and there was a chance to get in but at -1.0% for the day, I am done. I will not go on a losing binge and blow out 2-5% in a single day. I would puke my guts out over that I think. Almost done with school. I have 2 weeks left for the class I am in, then I have to study for a CLEP test and then I am done. Should be finished with the degree sometime in Feburary. Its been 30 years in the making and I am looking forward to it being complete! Once that is finished, I have to study for my continuing education test to renew my mortgage license. Everything is on hold in that arena until its done. Should be done sometime the week of the 19th I think. All the christmas shopping is done with the exception of two small gifts for the niece and nephew. I hate christmas shopping and so does my wife so we do it throughout the year when there are sales. Usually we are done by Thanksgiving. We will probably go to San Diego for the New Year, they are having a large firewords display this year and we all love fireworks. Should be fun! One last thing, I passed 50,000 page views on my blog yesterday. Not sure who's reading but since I don't promote it or link to it anywhere, I guess thats kinda cool. It means nothing other than a few people like watching me struggle! Take care. One more trading day in the week. Spent the morning watching price action. I didn't even open my charts. I watched the delayed feed on tradingview to avoid all temptation. 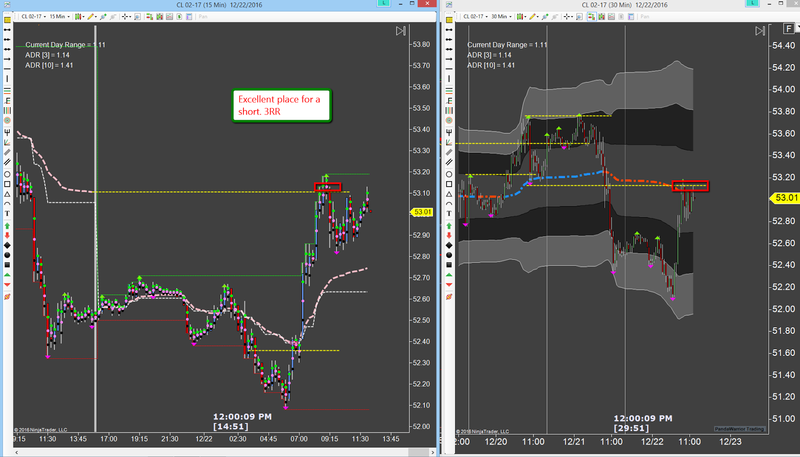 It was a brilliant day to trade crude oil. 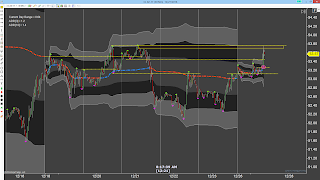 A single directional move beginning in the pre-market. There was some back and forth later on but the intent was always short. Price respected the levels quite nicely. It seems to do this when I'm not trading. The market makers must know I am on the sidelines or something. But honestly, it felt good to just sit and watch. No pressure, no need to make lots of decisions. Just watch and monitor price. I suspect that's how I need to feel with money on the line....easier said than done. Tomorrow I think I will dip my toe back into the water....see what the market offers tomorrow. I am watching 49.21 as a possible end to the short movement. At least temporarily. I've taken three days off so far. Probably going to take another 1-2 days this week. Been looking for answers as to why I am losing. Turns out its pretty simple. These manifest themselves almost exclusively in choking off trades that are winners. The fomo works like this. 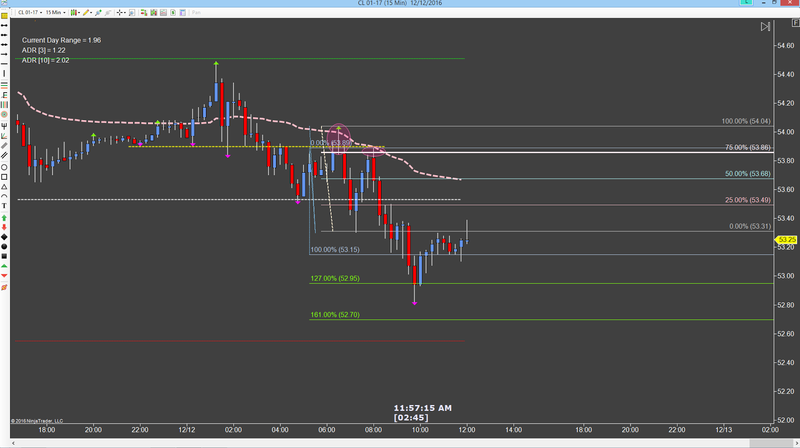 I am in a winning trade, its gone 15-20 ticks my favor but I have a planned exit at 55 ticks based on structure. I move to BE. Price takes me out and then goes to the original target. This happens a lot. Combine that with the normal distribution of losers and you are no longer a break even trader or a winning trader. You are losing. This is a drain on mental capital as well. Much frustration results from this behavior. The greed looks like this: I am in a winning trade. Its gone nearly all the way to my planned exit. I get greedy and extend the exit by another 50 ticks, price reverses and takes me out at a break even or some other much smaller gain. Ego looks like this: I have had a losing day so far for whatever reason. I rationalize that I am good enough to make it back so I keep trading. This works just enough to re-enforce this bad behavior. Or worse, I increase size to make it back. I don't do this often but once in a while it does happen. It happened last week. Of these three, the FOMO is by far the largest reason I am not making money like crazy. In my battle to end this behavior, I have over the years vacillated between trading small size and looking for big winners and trading larger size and looking for more smaller winners. The answer of course is to just put on the trade and walk away. But when I do this, invariably I get stopped out and some other larger move happens just before I get back to the computer. So when I get back to the charts for real, my plan for the remainder of the year and for next year is simply to avoid moving stops at all. Just let the trades play out. I'll watch videos, read, whatever, but if I am to make a long term career out of this, I need to solve this issue pretty darn quick. My year will end on December the 16th. I will not be trading past that date and I will resume on January 2nd, 2017. Long early well before the open. Out for only 10 tens. It went 130 after I exited. Short around the open. Scratched a couple, lost a couple. Got long, stopped again only to see profit target zone met a couple of bars later.....short after a long time, stopped to the tick then price went to target, the ORH.